The world knows the fact that Abhishek Bachchan is a family person. He unapologetically follows ‘family above everything’ rule. Time and again, he has proved that he is a loving hubby, an ideal son and a doting dad. 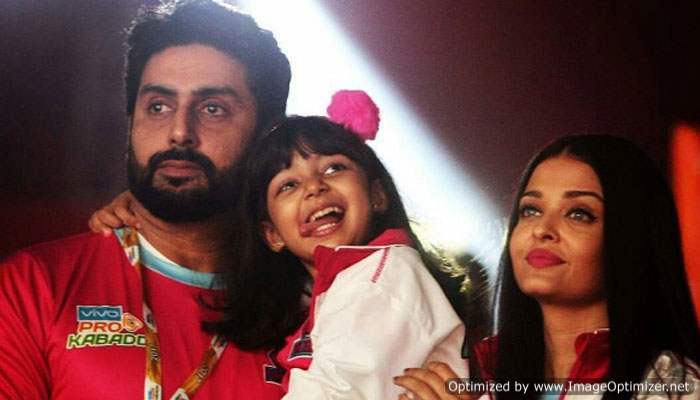 The ‘It couple’ of Bollywood, Aish and Abhi got hitched in 2007 and welcomed Aaradhya soon after. The little munchkin is now 10 years old and is mostly spotted with her mom. The tiny joy of bundle is also seen cheering for her dad’s teams Jaipur Pink Panthers (Kabaddi) and Chennaiyin FC. Moreover, whenever a family picture of this perfect trio surfaces on the Internet, it makes everyone go Awww. And this time, Aaradhya’s overloaded cuteness has left us all awestruck. So what happened is, Abhishek Bachchan visited his after 2 long months. Aaradhya had left an adorable note for him on his computer desk. He was so surprised that he shared it with his fans on social media. He shared a picture of the note on Instagram and wrote, “When you get back to office after 2 months and daughter has left you a note”. Have a look! Awww! Isn’t it super cute? Abhishek is presently shooting for Anurag Kashyap’s Manmarziyaan opposite Taapsee Pannu. The film is being hailed as Junior Bachchan’s big moment, this one can make or break his career. However, no matter how busy he remains with his work commitments, he makes it a point to spend time with his darling daughter. He keeps posting photos of her every now and then on social media. Here are some endearing posts by Junior AB! Isn’t Aaradhya’s note for her daddy sweet? Next story Karan Johar’s family picture is too cute to miss!